Launched on the market only a couple of months ago GRT12SM gives its excellency to the new geometry of the motor housing of Monster series. The difference between GRT12SM and the other Rasor's cutting units is because of the motor's housing held by a central foot fitted behind the blade in central position. This system spreads the shearing stress and the necessary stress to move the machine through the fabrics on both sides of the cutter giving it a perfectly straight and smooth cut. The knife is half-free on both sides to avoid winding problems even with tough fibers. This is why GRT12SM is especially suitable to cut composite materials like glass fiber, carbon fiber and Kevlar. 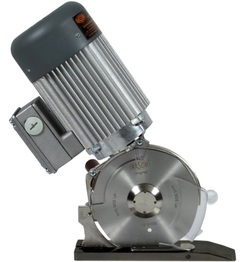 The three-phase induction motor is balanced and noiseless. It does not need any maintenance so to be easily used during the production process on 24 hours-a-day. This type of motor together with bronze/steel couplings give the cutting unit to be reliable. The 8-edges 120 mm knife allows a cutting capacity of 50 mm even for multiple layers. High torque combined with the slow RPM of the knife allow to cut even rubber materials and plastic based material in the field of carpets and industrial flooring. The push button sharpening stone allows the sharpening of the knife edge to be done in less than 10 seconds without removing the knife. The aluminum base is Teflon® coated to reduce friction with the material and can be installed on sliding rails within a small space. GRT12SM is especially suitable for the transversal cut, however it can be arranged on a fixed position. The minimum maintenance and handling costs make GRT12SM the most powerful and reliable cutting solution for any O.E.M. application.